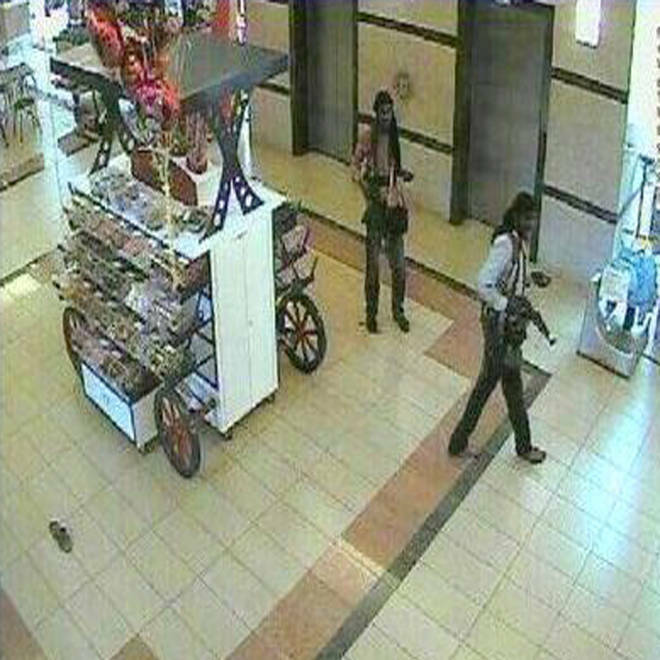 Closed circuit television shows terrorists inside Westgate mall. The Somali terror group that stormed a Kenyan mall, killing more than 60 people, has a larger U.S. contingent than any other al Qaeda offshoot, said U.S. officials, and is now more prone to mount deadly attacks on targets outside Somalia. Al Shabaab's attacks on foreign targets include an attempt to kill a U.S. congressman visiting Mogadishu in 2009. Rep. Donald Payne, D-N.J., was uninjured in the mortar attack. Via Twitter, al Shabaab has claimed that six of the jihadis holding hostages at Nairobi’s Westgate mall are Americans, and provided names for what it said were individuals from Minneapolis, Kansas City, Maine, Illinois and Arizona. Senior officials said that U.S. law enforcement has run the list of U.S. persons named on Twitter as involved in the Kenya mall attack against the list of U.S. persons known to be affiliated with Al Shabaab. They have found no match at this time. Officials said it was possible that the names were of individuals unknown to them, or that they were aliases acquired after U.S. jihadis arrived in Somalia, or that the Twitter information was false. "At this point, we have no definitive evidence of the nationalities or identities of the perpetrators," said State Department spokeswoman Jen Psaki at a Monday afternoon briefing. There were about 250 foreign nationals in al Shabaab in 2011, said officials, including Arabs, European converts and ethnic Somalis who were legal citizens of the U.S. and European countries. About 50 al Shabaab fighters were U.S. passport holders, including many young Somali-Americans from Minnesota and infamous Arab-American jihadi rapper Omar Hammami. American members of al Shabaab carried out three suicide bombings in Somalia between 2008 and 2011. All were from Minnesota. The terror group recently released a 39-minute on-line video called "The Path to Paradise: From the Twin Cities to the Land of Two Migrations" memorializing three Minnesotans who had died fighting in Somalia. But in 2011, al Shabaab began losing on the battlefield, and losing badly. After Kenyan, Ugandan and African Union troops drove al Shabaab from Mogadishu, the Somalia capital, and a stronghold in the coastal city of Kismayo, the numbers of foreign nationals plummeted. Many of the U.S. fighters were recruited in American cities with large concentrations of Somalis, particularly Minneapolis-St. Paul, where as many as 90,000 Somalis live, the highest concentration outside the home country. Much of the early recruiting was done at a single mosque in Minneapolis, but officials said it was often done “peer to peer” rather than by a single recruiter. An official said some foreign nationals were killed fighting for al Shabaab, including at least 10 Minnesotans. Hammami was apparently killed earlier this month as part of an internal Shabaab struggle. Other foreign nationals left Somalia to join up with al Qaeda in the Arabian Peninsula, al Qaeda’s robust Yemeni arm. Yemen is a few hundred miles across the Gulf of Aden from Somalia. Some of the U.S. jihadi recruits just went home, the official said. No American, including Hammami, has ever risen high enough in al Shabaab’s ranks to be on the U.S. government’s terror target list, said officials. American-born AQAP cleric Anwar al-Awlaki was on that list, and was killed in a U.S. air strike in Yemen in 2011. A U.S. official said, however, that al Shabaab’s misfortunes on the battlefield have only made it more dangerous outside Somalia’s borders. Prior to 2011, much of the group’s energy was spent trying to run the country and enforce strict adherence to fundamentalist Islam. 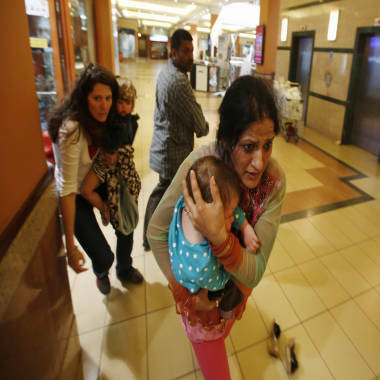 Women carrying children run for safety as armed police hunt gunmen who went on a shooting spree in Westgate shopping centre in Nairobi September 21, 2013. The official also said that al Shabaab has begun to regroup, and recover from its military setbacks, even as 4,000 Kenyan troops continue to occupy southern Somalia. "It's really too early to say if al Shabaab's latest attack is the beginning of a broader campaign in Kenya," said a U.S. official, "or a desperate attempt to compel Nairobi to withdraw its troops from Somalia." 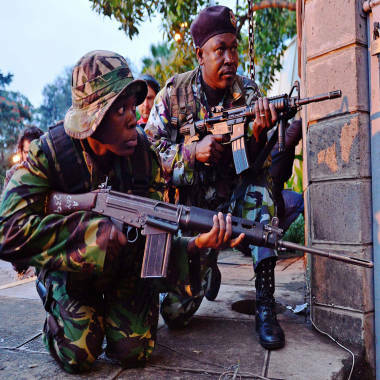 Al Shabaab has mounted small attacks in Mombasa, Nairobi, and Kenyan border towns, often using hand grenades, but was thwarted in two larger schemes. Kenyan authorities said they had stopped a terror plot aimed at Nairobi in 2012, and U.K. authorities disrupted a potential al Shabaab conspiracy in London in its early stages. In 2009, before African troops pushed them out of Somalia’s population centers, al Shabaab tried to kill Rep. Donald Payne, D-N.J., head of the House Foreign Relations Committee Subcommittee on Africa, with a mortar attack in Mogadishu. Al Shabaab took responsibility for the failed attack, which came just days after U.S. Navy SEALs killed Somali pirates who had taken a U.S. ship captain hostage in the Indian Ocean. In 2010, more than 70 people were killed in an al Shabaab attack in Uganda on fans watching the World Cup soccer final. The al Shabaab hostage standoff at the Westgate mall in Nairobi is now in its third day. The death toll is now at 68, with 175 injured, and a number of hostages are still being held by jihadis. While U.S. citizens were among the injured, no Americans have been confirmed dead. A U.S. official said, however, that information that al Shabaab issues via Twitter, whether it is promising external attacks or claiming specific U.S. members, should be taken with a grain of salt. Last month, al Shabaab claimed via Twitter to have killed CIA officer Gary Schroen, who led CIA operations in Afghanistan after 9/11. Gary Schroen is alive and well. NBC News' Richard Esposito, senior executive producer for the Investigative Unit, Chief Justice Correspondent Pete Williams and WBNC's Jonathan Dienst contributed to this report.